The twentieth meeting of the Emergency Committee under the International Health Regulations (2005) (IHR) regarding the international spread of poliovirus was convened by the Director General on 19 February 2019 at WHO headquarters with members, advisers and invited Member States attending via teleconference, supported by the WHO secretariat. 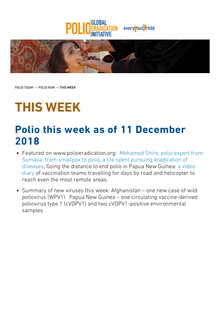 Featured on www.polioeradication.org: Mohamed Shire, polio expert from Somalia: from smallpox to polio, a life spent pursuing eradication of diseases; Going the distance to end polio in Papua New Guinea: a video diary of vaccination teams travelling for days by road and helicopter to reach even the most remote areas. 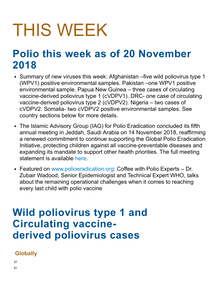 Summary of new viruses this week: Afghanistan –five wild poliovirus type 1 (WPV1) positive environmental samples. Pakistan –one WPV1 positive environmental sample. 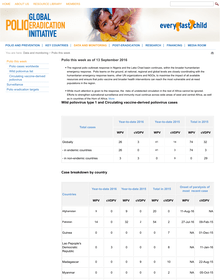 Papua New Guinea – three cases of circulating vaccine-derived poliovirus type 1 (cVDPV1). DRC- one case of circulating vaccine-derived poliovirus type 2 (cVDPV2). Nigeria – two cases of cVDPV2. Somalia- two cVDPV2 positive environmental samples. See country sections below for more details. 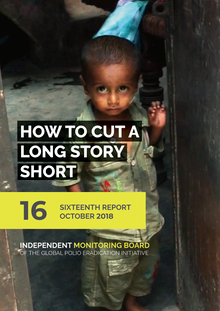 This is the 16th report produced by the Independent Monitoring Board (IMB) of the Global Polio Eradication Initiative (GPEI). 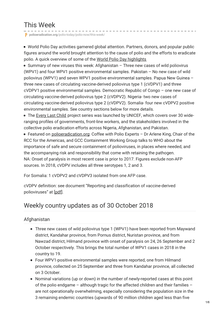 Summary of new viruses this week: Afghanistan – No new cases of wild poliovirus (WPV1) or WPV1 positive environmental samples. 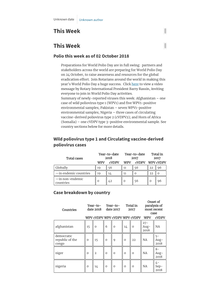 Pakistan – Two new cases of wild poliovirus (WPV1) and two WPV1 positive environmental samples. Papua New Guinea – no new cases reported this week. Democratic Republic of Congo – two new cases of circulating vaccine-derived poliovirus type 2 (cVDPV2). Nigeria- four new cases of circulating vaccine-derived poliovirus type 2 (cVDPV2). Somalia- no new cases reported this week. Niger- one new case of circulating vaccine-driven polio virus type 2 (cVDPV2). 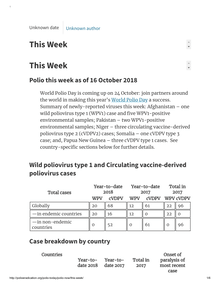 Summary of new viruses this week: Afghanistan – Three new cases of wild poliovirus (WPV1) and four WPV1 positive environmental samples. World Polio Day activities are in full swing. Join partners around the world in raising awareness about the global effort to eradicate polio. 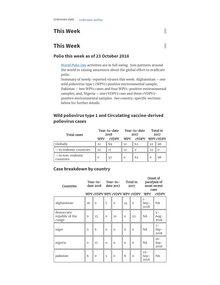 Summary of newly-reported viruses this week: Afghanistan – one wild poliovirus type 1 (WPV1) positive environmental sample; Pakistan – two WPV1 cases and four WPV1-positive environmental samples; and, Nigeria – one cVDPV2 case and three cVDPV2-positive environmental samples. See country-specific sections below for further details. World Polio Day is coming up on 24 October: join partners around the world in making this year’s World Polio Day a success. 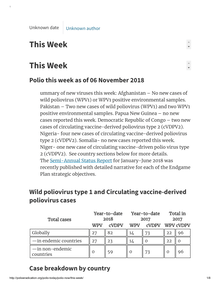 Summary of newly-reported viruses this week: Afghanistan – one wild poliovirus type 1 (WPV1) case and five WPV1-positive environmental samples; Pakistan – two WPV1-positive environmental samples; Niger – three circulating vaccine-derived poliovirus type 2 (cVDPV2) cases; Somalia – one cVDPV type 3 case; and, Papua New Guinea – three cVDPV type 1 cases. See country-specific sections below for further details. Papua New Guinea’s National Department of Health, WHO, UNICEF and partners issue a ‘100 Days Report’: featuring the highlights of response operations so far, the report is dedicated to the thousands of front-line polio workers who brave difficult conditions and work long hours to protect children in Papua New Guinea from polio. 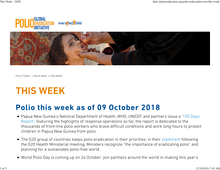 Preparations for World Polio Day are in full swing: partners and stakeholders across the world are preparing for World Polio Day on 24 October, to raise awareness and resources for the global eradication effort. Join Rotarians around the world in making this year’s World Polio Day a huge success. Click here to view a video message by Rotary International President Barry Rassin, inviting everyone to join in World Polio Day activities. 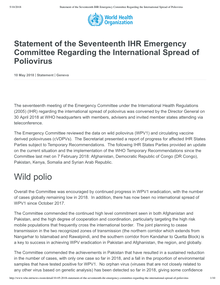 The seventeenth meeting of the Emergency Committee under the International Health Regulations (2005) (IHR) regarding the international spread of poliovirus was convened by the Director General on 30 April 2018 at WHO headquarters with members, advisers and invited member states attending via teleconference. 13 JUNE 2017 | GENEVA - World Health Organization Director-General elect, Dr Tedros Adhanom Ghebreyesus has welcomed contributions and pledges of US$1.2 billion for the Global Polio Eradication Initiative. The pledges were made at the Rotary Convention in Atlanta, USA which is being attended by 32 000 Rotarians from around the world. “It is humbling to see again the power of this incredible global partnership to generate funding to fight one of the world’s most horrible and debilitating diseases,” said Dr Tedros. This week we have been marking International Women's Day with inspiring stories about people who are tackling gender inequality. Here we look at the continuing attacks on girls' education. Around the world there are 121 million children and adolescents who don't go to school. Girls make up 53% of those out of primary school and 52% of of those out of lower secondary school, even though only 48% of the world’s under-15 population are girls, according to the Global Partnership for Education. It has been a difficult year for the global campaign to eradicate polio. 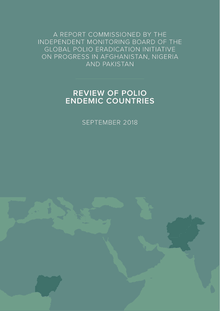 In August, two new wild polio cases were reported in Nigeria, which accounted for half of the global count in 2012 yet had not recorded a single wild polio incident since July 2014. It was a year away from being certified polio-free by the World Health Organization. 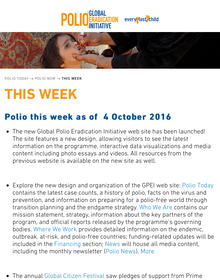 The new Global Polio Eradication Initiative web site has been launched! The site features a new design, allowing visitors to see the latest information on the programme, interactive data visualizations and media content including photo essays and videos. All resources from the previous website is available on the new site as well. The regional polio outbreak response in Nigeria and the Lake Chad basin continues, within the broader humanitarian emergency response. Polio teams on the ground, at national, regional and global levels are closely coordinating with the humanitarian emergency response teams, other UN organizations and NGOs, to maximise the impact of all available resources and ensure that polio vaccine and broader health interventions can reach the most vulnerable and at-need populations in the region. In Nigeria, one new wild poliovirus type 1 (WPV1) case has been reported, from Borno state, following confirmation of two cases in August. Regional outbreak response across north-eastern Nigeria and the Lake Chad sub-region is continuing within the broader humanitarian emergency context. Detection of new cases at this point is not unexpected or unusual, particularly as surveillance is being strengthened (including by conducting retrospective acute flaccid paralysis case searches).